Approaching The Object is an ongoing project of developing a solo improvising practice based around instinctive and investigatory responses to objects and the way thought processes and everyday life influence and inform my approaches. It dispenses with electronics and effects and focuses on making sounds through interacting with objects. This began as the final major project of my Sound Arts MA at London College of Communication as a way of going ‘back to basics’. Looking for connections between apparently disparate actions and ideas around improvising. ^In the studio at London College of Communication, 2014. "Making sounds with objects is an integral part of my work and one of it's core components. The aim of the project has become to investigate this part of my practice and consider the ideas, approaches, directions and questions raised by thinking about the act of simply interacting with objects to create sounds. The term "object" is also applied to instruments as well as other things since in the physical part of this process they are all treated as materials with the potential to make sound through interaction and are not always approached in the intended manner. There will be a focus on my own process-led approach, my work and life as an ongoing continuum of thinking and doing and the various influences and areas of research relevant to the project." On 7th December 2014 the live performance "Approaching The Object" was presented at Angus-Hughes Gallery, London and supplemented by the self published booklet "Document For Approaching the Object" containing selected notes, images and texts from the on-going project. The document was handmade and partly designed on the page then reproduced by photocopier. 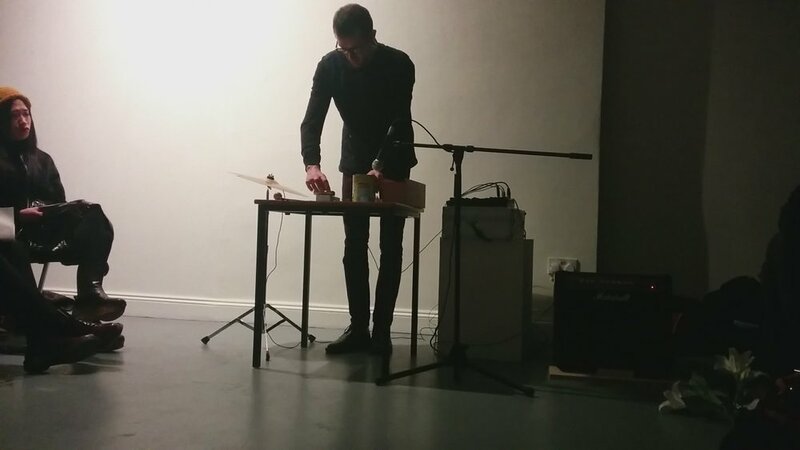 ^Performing Approaching The Object at Constantly Evolving But Never Ending, Angus-Hughes Gallery, London 2015 using cocoa tin, metal ruler amplified table top, glass jar, cymbal and various found and collected objects. Different parts of the project have been documented in different ways at different times- including sound recording, blogging, notebooks and photography. Further documentation will be added soon.